The Talking Portraits show covers a wide range of topics on technology and people, using an informal and thought-provoking style. He maintains a podcasting blog at talkingportraits.blogspot.com. For the last two years, Tom has also been producing and hosting a weekly podcast show at EnterpriseLeadership, sponsored by BMC Software. To date, he has interviewed more than 70 C-level executives. Tom founded Tom Parish Inc., a social media consultancy, working with clients to produce audio and video podcasts with an emphasis on how to make shows both relevant and popular. One example is TalkBMC, a weekly show with more than 120 episodes and an audience in the thousands. This show, combined with Tom's strategy for corporate blogging to accompany the podcasts, has helped BMC Software create an entirely new connection with their clients on the web. 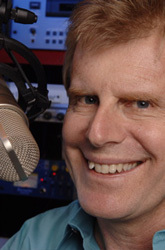 Tom started producing audio shows in 1998 for the Motorola Digital DNA Radio show which reached a global audience back when MP3 was as common as moon dust. Tom can be found in his studio in Austin, Texas producing shows and coaching clients on new marketing strategies and new media opportunities for business growth. Tom can be reached via email tom.parish AT gmail.com and when time permits adding insights to his LeverageSocialmedia blog. This page shows 1 to 10 of 15 total podcasts in this series. WiMAX, a new wireless broadband standard, is coming, and the buzz is growing. How is it different from what is available today, and where will it take wireless broadband in the future? These and other questions are answered by Tim Sanders, a leading industry expert and champion for this new wireless technology. The SXSW Interactive Festival features five days of exciting panel content and amazing parties. Attracting digital creatives as well as visionary technology entrepreneurs, the event celebrates the best minds and the brightest personalities of emerging technology. Hugh Forrest, Director of Events for the festival joins Tom to discuss the event. In this talk, Giovanni Gallucci, a search engine optimization and social media expert, a speaker, blogger and co-founder of Dexterity Media, spills out the secrets of a successful online marketing philosophy that leverages the communal strength of social networks such as MySpace, Facebook, etc. He contrasts social media against traditional marketing by providing case studies of companies that succeeded as well as those that've failed at it. What started out as a search for different quality experiences for Gigi Sage, has become a life long pursuit to create harmony in all area of her's life and how to make all kinds of relationships work. In this interview, Sage pulls from over twenty years of teaching and working with women to offer help for men and women everywhere who are looking to build harmonious personal and professional relationships. Since his early attraction to the new Internet industry in the early 1990's Jake McKee has slowly moved to the center of the growing debate over the use of social media within businesses. Factors impacting this debate include the organizational changes required to embrace social media, the need to acquire social media technology, and dealing with management resistance. In this interview, McKee shares his experiences with helping organizations brainstorm, detail, and implement strategies for engaging with and learning from their customers. Social networking can transform communication and build powerful connections, but getting it right in the enterprise takes a special touch. David Bankston shares his experience as a technologist and entrepreneur in this lively discussion of ways in which software-as-service and social media can help businesses manage customer feedback and build brands and communities on line. "Sometimes you've got to think like a surfer--lie low, go with the flow, and ride the wave. And sometimes you've got to be the cowboy--ride into town, call the bluff, and face the music in the showdown." Dr. Elliot McGucken explains how artists can find financial success by seeing their quest as a classic Hero's Journey (ala Joseph Campbell). By keeping the hero's goal of staying true to his art and passionately following the journey, the artist can turn his creative wealth into financial wealth. Esther Dyson is best known for her work with technology, but many people may not be aware of the breadth of her other interests. This interview delves into some of Ms. Dyson's many pursuits, such as her Flight School workshops and her recent blogging contributions. Her interest in "air and space" activity is underscored by her advocacy social media's use as a tool that will enhance user experiences and ultimately create a new market. In this interview Steve Marx, CEO of the Center for Sales Strategy and author of the book "Close Like the Pros," introduces a whole new way of thinking about closing B2B sales, turning the old-school "hand-off selling" concept on its ear. In Marx's interactive selling approach the sale is a process rather than an event. He explains why interactive strategies take advantage of the current choice-filled B2B landscape, enabling more efficient, productive, and successful sales. Virtual booty has become more important to some online game players than feeding their real bodies in the physical world. Deb Radcliff, veteran online security writer and Vice President of Publishing for The Security Consortium discusses what is happening now that criminals have started to take advantage. In addition to discussing how the ability to monetize booty began, she identifies who the criminals are and what methods they are using to accomplish their acts.